If you’re prepared for venturing out into the elements, there are a number of photo opportunities you might want visit this week, all within a very short travel distance. 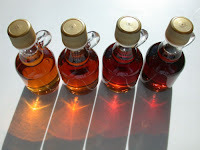 A couple of these events start with a pancake breakfast and authentic Ohio maple syrup. Photo tip: Take a fast lens or a flash as these maple shacks tend to be very dark inside. History of Maple Sugaring (Cuyahoga County) March 6th and 7th walk along the Sugarbush Trail from 11 a.m. until 4 p.m. to observe sap-collection and syrup-making processes that are century’s old. History hikes will end at the Sugarhouse where you can get photos of the sap being boiled down into genuine 100% pure maple syrup. Guided hikes leave the Sugarhouse every 20 minutes with the last one leaving at 3:40 p.m. Maple Grove Picnic Area is located off Valley Parkway in Rocky River Reservation, between Cedar Point Road and Spafford Road in Brook Park, south of Rocky River Nature Center. GPS- Lon -81.88265 Lat 41.40501 Phone: 440.734.6660 For more info, consult their Web site. Maple Sugaring at the Carlisle Visitor Center (Lorain County) March 6th and 7th walk the sugar trail with a Naturalist or ride the train, weather permitting. The Sugar Shack is open from noon til 4 p.m. There are also talks and videos about maple sugaring. There is an all-you-can-eat pancake breakfast on March 7th from 9 a.m. until 1 p.m. organized by the Friends of the Metro Parks. See their Web site more information. Carlisle Visitor Center is located at 12882 Diagonal Road, LaGrange, Ohio 44050. Great Blue Heron Day (Summit County) March 6th celebrate Cuyahoga Valley National Park’s great blue herons at the Bath Road heronry with hikes led by a ranger or hop on the free shuttle. Start the morning with a pancake breakfast at Old Trail School, 2315 Ira Road, Bath, OH. From 9 a.m. – 1 p.m. Breakfast, crafts and the heron hike are all available for one price: $8 for adults, $6 for children 6-12, 5 and under are free. There is an optional sunrise hike at 8 a.m. For more info call 800.642.3297, ext, 100 or see their Web site. Next week we’ll be looking at the annual return of the buzzards, and more maple events on the east side.